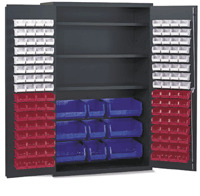 Add versatility and security to your storage environment with Vari-Tuff (TM) brand storage cabinets. Not only can you conveniently store a variety parts, supplies and materials in these quality-crafted cabinets, but you can assure their security as well. Cabinets come in 36", 48" and extra wide 60" styles to accommodate your workplace. And with a variety of shelving and utility bin options, storage alternatives are virtually endless. Each cabinet features our handy 3-point locking system with its own unique set of keys to ensure the security of materials. 14-gauge steel construction and 3-point locking handle keep contents safe and secure while providing 25% more storage space than standard 38” cabinets. Comes with 137 removable bins and 3 adjustable shelves. Model VC-7841 includes: (64) 4"Wx5"Lx3"H; (64) 4"Wx7"Lx3"H; (3) 8"Wx15"Lx7"H; (6) 16"Wx15"Lx7"H; (3) 18"Wx48"D shelves. Model VC-7842 (all yellow bins): (64) 4"Wx5"Lx3"H; (64) 4"Wx7"Lx3"H; (3) 8"Wx15"Lx7"H; (6) 16"Wx15"Lx7"H; (3) 18"Wx48"D shelves.